Adlai Ewing Stevenson II. (5. února 1900, Los Angeles — 14. července 1965, Londýn) byl americký politik, guvernér státu Illinois v letech 1949—1953 a prezidentský kandidát ve volbách 1952 a 1956. When demagoguery and deceit become a national political movement, we Americans are in trouble; not just Democrats, but all of us. 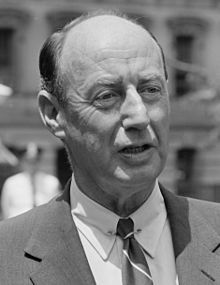 ↑ Adlai Ewing Stevenson: An Urbane, Witty, Articulate Politician and Diplomat. nytimes.com [online]. 1965-07-15 [cit. 2015-10-31]. Dostupné online.